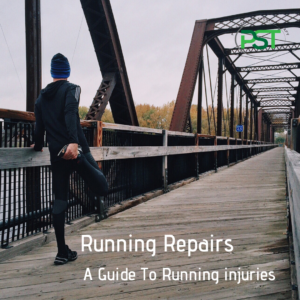 IT band pain is a common complaint amongst runners and the causes of it often appear to be mysterious but are they really? The IT band runs down the side of the leg from the iliac crest to the lateral aspect of the tibial plateau on the tibial tubercle. It originates from the fibres of the Gluteal fascia, and the Tensor Fascia Lata and ending where it blends into the fascia of the lower leg around the peroneals and tibialis anterior. So we can see there are a number of areas that there are a number of obvious areas that the problems can develop. The first of these centres around the glutes: poorly functioning or underdeveloped glutes can cause issues into the IT band. 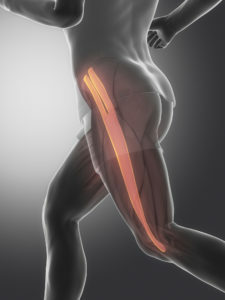 Glutes that are either poorly developed or don’t fire correctly can create instability of, in the pelvis, through poor control at the mid-point of the gait cycle, and stress on the band itself as the gluteal fascia tightens. As well as considering what is happening at the origin of the ITB we need to think of what is happening at the insertion point on the lateral condyle of the tibia. The IT Band is thought to help with controlling medial rotation of the tibia and any excessive medial rotation here can lead to problems. This then takes us to what is happening at the ankle and foot where this rotation is likely to originate, though the semimembranosus and semitendinosus are also possible sources. Stiffness within the ankle is quite common with distance runners, particularly the talocrural and subtalar joint. The dysfunction within these joints can cause a decrease in dorsi flexion and an increase in medial rotation of the tibia is a result of this due to the amount of time the foot then spends in inversion and pronation to compensate for this. It is this medial rotation that can contribute to ITB pain. 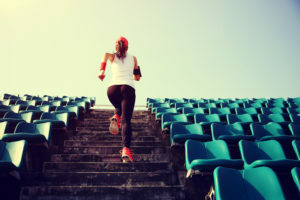 If we are to treat the problem effectively, as always, we need to think about more than just treating the problem itself, in fact simply working the IT band itself will do little but give temporary relief. We must include in the rehabilitation process work from the glutes down to the foot to ensure we are removing any fascial strain and returning full movement to the affected joints. This as always needs to involve both exercise and bodywork. To ensure that the glutes are working the exercise in my “It might not be your back” post is one to do before doing any exercise to help switch them on. Gluteus Medius plays a massive role in stabilising the pelvis and this is a great exercise to rehab it, though you don’t need to use the band that PJ is using. To help ensure you maintain the mobility in the sutalar joint this one would be a good choice to use in your warm up.